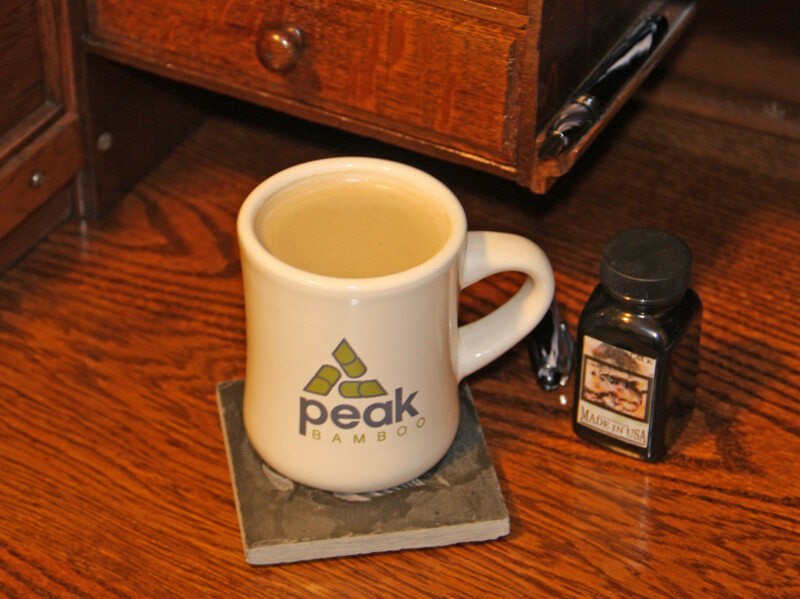 Peak Bamboo Supports Caffeine Addiction! Peak Bamboo’s coffee mugs are now in stock at Golden Witch. 5:30 AM. These are heavy-duty, vintage-style mugs, reminiscent of the sort your grandfather would have held out for a free refill at his favorite greasy-spoon diner. Steaming black coffee, two or three extra mugfuls after a plate of steak and eggs. The canvas waders, the creel, and the bamboo rod all wait out in the back of the truck. Half an hour until dawn begins to part the darkness from the mist rising over that fishing hole that was his daddy’s before him. Trout sipping, delicate rings dotting the glassy water. Go find this place with your bamboo rod, but start the day right with a hearty dose of caffeine! Fair warning: like the handles on so many diner mugs, these are smaller. But the mugs are waisted, so you grip around the mug to warm your hands on a brisk morning. We probably don’t need to tell you this, but the first two ladies who picked up the mugs both said, “how are you going to get your fat fingers inside that handle?” Well, I’m not. And neither are you, not all of them anyway. These are old school mugs, for older, schooled, anglers. We know the value of things made the way things used to be made. Well made. The mugs are available in your choice of black or natural. The front is emblazoned with the Peak Bamboo logo. On the back, the dictum: Fish Grass. There’s a thought to sustain you while you sip that scalding coffee, waiting patiently on the coming dawn. No, they’re not cheap. Nothing worthwhile is. Get yours now, or wait and pick one up when you visit Sycamore Mill in 2017. We’ll have a pot of coffee waiting for you, one Saturday morning each month after the mill opens.